Slippages against the judiciary in Romania and other Eastern European countries triggered a strong reaction of the main donor states to the EU budget. The European Commission is considering proposing on May 2nd, 2018, a mechanism whereby Member States breaching the rule of law and the independence of the judiciary are penalized by losing European funds, several sources from Brussels told G4Media.ro. The mechanism provides for linking the judiciary to EU funds via the European Semester, a key instrument in the EU architecture, but almost unknown to the public. If found guilty of violating the fundamental principles of the EU, Romania risks losing billions of euros. Several Member States oppose to this mechanism, as tough negotiations are taking place in Brussels. However, the tool put forward by the European Commission sparks strong controversies among Member States. European diplomats told G4Media.ro that it would be extremely difficult for Brussels to create a coherent and fair filter that would not lead to slippages. „This mechanism is hard to figure out, how do you manage to create a tool that fits all situations in 27 countries? If the mechanism is not solid, the sanctioned Member States would attack the European Commission in the European Court of Justice, the court proceedings are timely, and there is a risk that the European Court of Justice would abolish this package, „an European diplomat told G4Media.ro. „The method of sanctioning by the Commission is perverse, it can have opposite effects if it is politically used by national governments. For example, it could increase Euroscepticism “, another EU diplomat warned. The mechanism that provides for EU funds to be linked to the European Semester is proposed by the countries net contributing to the EU budget, especially Germany, the Netherlands and the northern states, motivated by the fact that EU funds are stolen or deficiently spent in countries where the judiciary operates poorly or is politically subordinated. One clear example is Hungary, a country where OLAF reports on the embezzlement of hundreds of millions of euros by the close friends of Prime Minister Viktor Orban are completely ignored by politically subdued justice. According to the EU Council, the European Semester is a cycle of economic and budgetary policy coordination across the EU. The European Semester is one of the EU instruments in the economic governance framework. It contributes to ensuring convergence (i.e. eliminating economic differences between Member States) and stability in the EU. If the European Commission’s proposal is adopted, the European Semester would have a fourth major goal: the justice system of each Member State. It will pursue two key issues: independence of the judiciary and guaranteeing the rule of law. Another scenario considered by the European Commission was the decoupling from EU funds of countries not participating in the new project on the creation of an European Prosecutor’s Office that would fight EU funds fraud. The obvious targets of this scenario would have been Poland and Hungary, countries that have refused to participate in the „European Prosecutor’s” project and where politics is increasingly affecting the judiciary. Finally, the Commission abandoned this option because it ruled out the possibility for other Member States to be monitored. Representatives of net contributing states, as well as the European Commission, want the new mechanism to be approved by the EU Council and the European Parliament until the European elections in spring 2019, according to sources consulted by G4Media.ro. Why the hurry? For several reasons. Firstly, it is essential that the newly created mechanism to apply for the future multiannual EU budget starting in 2021. Secondly, the current political structure of the European Parliament allows for a vote on this proposal. The future European Parliament resulting from the 2019 elections could have a much more complicated structure for cooperating with the European Commission. In addition, the cumbersome procedure of setting up the next political majority would translate in a major delay in implementing the mechanism proposed by the Commission led by Jean-Claude Juncker. Moreover, the countries initiating this mechanism want to change as quickly as possible the current situation, where the European Commission has practically its hands tied in front of slippages against the judiciary in countries such as Poland, Hungary, Romania or Malta. EU leaders have not created such an enforcement mechanism so far because at the times of the EU’s successive enlargements no one considered the scenario where new nations join the Union to backtrack in such areas as justice. 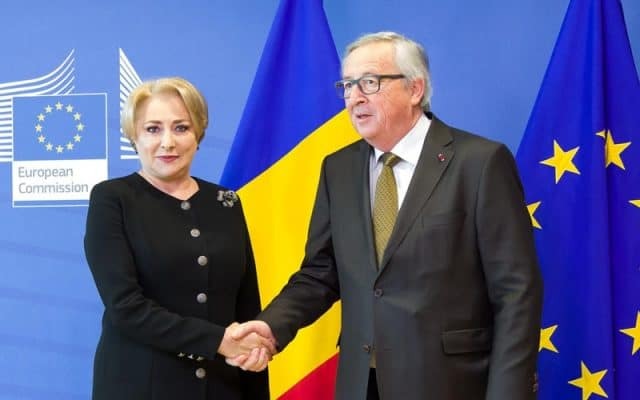 Paradoxically, the European Commission’s proposal is likely to be adopted even during the Romanian presidency of the EU Council in the first half of next year. The Commission proposal requires a simple majority in the EU Council, where the line ministers of the Member States assemble. The European sources quoted told G4Media.ro that currently there is a favorable majority in the EU Council. Following Council approval, voting is required in the European Parliament. The European Commission will issue annually, at the beginning of each year, for each Member State, a set of recommendations in the justice and economic areas. Recommendations will be mandatory. Recommendations will have the power of ex-ante conditionality currently required for European funded projects. Now, the European Commission approves major EU funding programs (infrastructure, human resources, etc.) only after each Member State has fulfilled these ex-ante conditions. An example of ex-ante conditionality: Romania could receive EU funding for large infrastructure only after approving the Transport, Masterplan, i.e. the strategic investment document. If a Member State fails to act as requested by the European Commission and approved by the EU Council, a complex mechanism would be put in place to prevent the respective country from accessing certain categories of European funds. Regaining access to EU funds would only occur when that Member State implements the recommendations of Brussels. The Romanian government has rejected, through the voice of the foreign minister, any possibility that European funds become contingent. On February 1st, Teodor Melescanu said that linking EU funds to „other elements” would constitute a „gross violation” of the European Union principle. Melescanu also said in a joint press conference with his Polish counterpart that European funds are instruments for increasing the convergence of EU Member States, not „charity”. The fear of Bucharest is that if the mechanism goes through all the stages of approval in the complicated EU decision-making process, Romania will enter in 2020 a new justice monitoring mechanism in addition to the current CVM. Even with the opposition of some countries that feel targeted, such as Hungary, Poland and Romania, the European Commission’s plan is likely to come into force, as a favorable majority is already emerging in both the EU Council and the European Parliament.